Despite a rally in global equities, Indian markets lost ground on Monday, as investors assessed the nation’s retaliation to a deadly attack on its defense forces last week. Benchmark indices ended nearly 1 per cent lower on Monday, led by a decline in PSBs, IT and FMCG (fast moving consumer goods) stocks. The S&P BSE Sensex ended at 35,498, down 311 points or 0.87 per cent, while the broader Nifty50 index settled at 10,641, down 83 points or 0.78 per cent. "Market remained on a selling spree as reducing foreign inflows due to fear of escalation of tensions at the border impacted the sentiment. Rupee weakened, 10-year yield inched up and rising oil prices are expected to weaken domestic macros. Volatility is likely to continue due to lack of domestic triggers and investors are likely to remain cautious. Global market stands positive supported by hope in US-China trade deals," said Vinod Nair, head of research at Geojit Financial Services in an emailed note. Among sectors, the Nifty FMCG index ended 1.3 per cent lower weighed by Dabur and Procter & Gamble Hygiene and Health Care. The Nifty PSU index settled 1.44 per cent lower driven by a fall in Bank of India and IDBI. 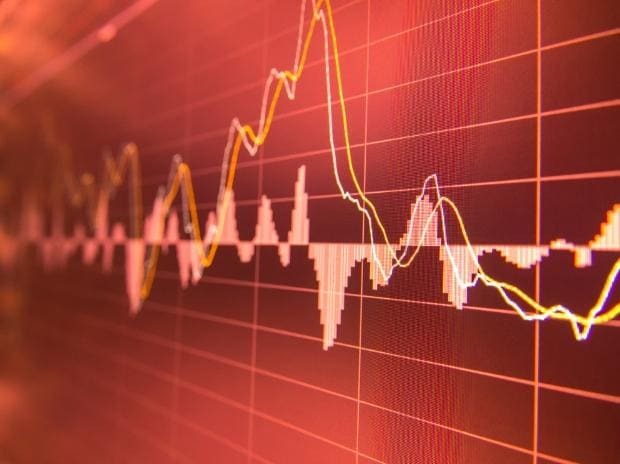 In the broader market, the S&P BSE MidCap ended 145 points or 1.04 per cent lower at 13,795, while S&P BSE SmallCap index settled at 13,118, down 134 points or 1.01 per cent. Meanwhile, the rupee has gone from being the best-performing Asian currency last quarter to the worst this year as rising crude prices and tensions over Kashmir weigh on sentiment. Shares of IPCA Laboratories hit a 43-month high of Rs 828 apiece, up 7 per cent on the BSE in intra-day trade on Monday, on the back of healthy operational performance in December 2018 quarter (Q3FY19). The stock ended 3.87 per cent higher at Rs 805. Shares of Dish TV India moved higher by 13 per cent to Rs 37.10 apiece on the BSE in intra-day trade on Monday in an otherwise weak market. The stock settled at Rs 34.75, up 5.62 per cent. Asian share markets bounced broadly on Monday as investors dared to hope for both progress at Sino-US trade talks in Washington this week and more policy stimulus from major central banks. MSCI's broadest index of Asia-Pacific shares outside Japan rose 0.9 per cent, largely recovering from a sharp fall last Friday. Japan's Nikkei climbed 1.8 per cent to its highest level of the year so far, while Shanghai blue chips rallied 2.1 per cent.